The United States Ambassador to the United Nations, Susan Rice, identified Kashmir as one of the world's hot spots and bracketed it with contested regions such as the Balkans and Golan Heights during her testimony before the Senate Foreign Relations committee last month. Likewise, in an interview with Time magazine in November 2008, President Barack Obama stated that "working with Pakistan and India to try to resolve the Kashmir crisis in a serious way" was one of the most "critical tasks" for his administration. 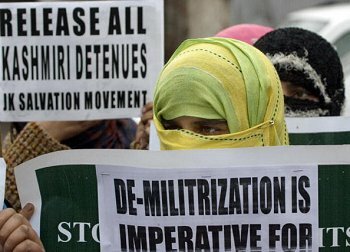 With worldwide attention once again focused on Kashmir, all major stakeholders in the region — Pakistan, India, Kashmiri separatists, religious extremists, and peacebuilders alike — are hoping that the renewed international spotlight can facilitate an end to the decades-long conflict that has resulted in over 80,000 deaths and hundreds of thousands of displaced people. Contrary to widespread perceptions of a conflict-torn Kashmir, rife with military intervention and armed uprisings, the region remained relatively peaceful until a few decades ago when an armed struggle for separation from India started. For the most part, Kashmir maintained a sense of communal harmony throughout the war in 1948, following Pakistan's independence from British India in 1947. And although the Kashmiri region of Jammu was witness to the worst kind of massacre and exodus of Muslims to the neighboring areas of Pakistani-ruled Punjab during the war, this did not affect the daily life of most Kashmiris outside Jammu. Kashmir is comprised of three distinct religions and regions — In Kashmir Valley, 98 percent of the population is Muslim; in Jammu, 60 percent of the population is Hindu; and in Ladakh, 49 percent is Buddhist. Kashmiris have always been proud of their diverse cultures, traditions and religions, with Hindus, Christians, Buddhists and Muslims living together in communal harmony. Even Gandhi lauded the Kashmiris for their peace-loving nature and called Kashmir "a ray of hope in the darkness." While the roots of the present conflict trace back to the time of partition, the more recent violent struggle began when Kashmiri Muslims, emboldened by the Afghan success in the fight against the Soviets, launched a similar movement against India in the late 1980's. The ensuing 18 years of armed revolt created religious divides where previously there were none, and caused 200,000 Kashmiri Hindus to flee the Valley. Eventually, however, the armed struggle waned, due to international pressure and decreased popular support for violent tactics in the wake of 9/11. In 2008, mass uprisings in Kashmir began again when the Indian government proposed donating a large portion of Kashmiri land for a Hindu shrine. Kashmiri Muslims saw this as a plan to change the demographic of Kashmir, which would inevitably result in new Hindu settlements and began protesting against India. Despite some casualties, these protests remained largely peaceful. On August 18, 2008, over half a million people took to the streets of Srinagar, the capital of Kashmir, and marched to the office of the UN Military Observer Group in India and Pakistan (UNMOGIP) at the Sonawar settlement in Srinagar, to remind the world that the issue of Kashmir was still pending. These mass protests attracted support from Indian civil society groups and attention from the international community. Kashmiri stakeholders, including militant groups, enthusiastically welcomed this renewed international interest in the resolution of the Kashmir conflict. Even Syed Salahudin, chief of Hizb ul Mujahideen (the Mujahideen Party), on behalf of the United Jihad Council — a group of several militant organizations — stated that Obama and Rice's statements were encouraging in bringing about a resolution to the Kashmir conflict. In addition, the recently-elected chief minister of Indian-controlled Jammu and Kashmir, Omar Abdullah, said in his swearing-in ceremony on Jan. 5 that he wholeheartedly supported normalization between Islamabad and New Delhi, and publicly pledged that he would facilitate the settlement of the Kashmir issue. While these non-violent demonstrations have attracted the world's attention, given Obama's recent acknowledgment of the conflict, words alone cannot help; concrete actions must be taken by the United States to facilitate lasting peace in the region. As a first step, the Obama administration should appoint a special envoy to Kashmir. Indeed, the announcement was made at the end of January that the mandate of United States envoy to South Asia Richard Holbrooke would not include Kashmir, leaving the position open for someone else. This envoy should encourage India and Pakistan to include Kashmiri representatives in consultation, and promote dialogue between the two countries throughout the process. By re-igniting the Pakistani-Indian peace process and engaging Kashmiris in dialogue — along with Pakistanis and Indians — the United States can provide assistance in resolving the Kashmir problem, which has thus far been a major hurdle in establishing peace in the region and fostering healthy relations between the two nuclear states. Ershad Mahmud is a Kashmiri political analyst based in Islamabad, Pakistan.